From the early 1930’s all through to the 1940’s, Kuda Bux, who sometimes billed himself as Professor K. B. Duke, toured many countries with his blindfold and X-ray eye act. At times he presented a rather lavish illusion show that included such items as Shooting a Ribbon through a Lady, his own version of a Levitation of His Lady Assistant, and a quite spectacular Vanish of a Lady who, folding her two arms across her body while holding two colourful silken butterfly scarves, would suddenly disappear. Kuda Bux also presented the Coin Ladder illusion where the performer plucks an endless stream of silver coins from the air and drop them into a large ladder-like frame, where the coins are seen to trickle down the ladder rungs into a receptacle. In this illusion, it appears that the performer has produced a continual stream of silver coins. The Coin Ladder effect has become a signature illusion for many magicians. But the strongest routine Kuda Bux became well-known for was his blindfold act. He claimed that his power came from being a daily and devout practitioner of yoga and transcendental meditation. When demonstrating this strange ability while completely blindfolded, Kuda Bux claimed that 1) he was unable to physically see anything with his eyes completely covered, and 2) he used a form of intuitive sixth sense. A committee would be invited onstage to blindfold him, starting with lumps of bread dough placed over his eyes. This was followed by large pads of cotton wool, and then by gauze bandages and cloth bands placed across his eyes diagonally then around his head and chin. It seemed obvious that with his eyes and head covered in such a way, it was impossible for him to see. It was reasonably well-known that some magicians, when blindfolded, were in fact able to see a little by looking downwards alongside their nose. However in Kuda Bux’s case, this seemed almost impossible to do. Once fully blindfolded, the volunteers would be invited to write or draw anything on a large blackboard with Kuda Bux standing nearby. Spectators could write anything—words, sentences, numbers, drawings and even simple mathematical problems. The “Man with the X-Ray Eyes” would then immediately duplicate exactly what had been written on the board, going so far as to copy it precisely the way the original was written or drawn. Kuda’s duplication included replicating every slight nuance or difference in the script or printing to perfection. It was uncanny. No other performer before him had done a blindfold duplication act with such accuracy. The writing or drawing looked to have been done by the same person. Each performance was quite remarkable. If a spectator did an elaborate chalk design, Kuda Bux was able to replicate the design exactly. Once a series of these experiments was completed, the committee would remove the eye coverings. In 1934, Kuda Bux underwent a series of tests with a team of journalists and scientists who used even more elaborate ways of sealing his eyes. They used dough, tin foil and rolls of woolen bandage and gauze. Despite this, Kuda Bux was able to read whole passages from books held in front of him and he completed all the blackboard tests. In 1935, he was examined and investigated by a team from the University of London’s Council for Psychical Research and media reporters. Kuda Bux was once again successful. He was often examined by doctors and written about in medical journals. During a semi-scientific test, Kuda Bux was asked whether he could see through steel. He replied that he needed to either touch whatever had been written or be relatively close to it. He was asked to stand behind a door with his arm and hand around the side while a book was held by the investigator. He then proceeded to read from the book while blindfolded and unable to see the book. He was also able to read the dates on coins, thread a needle and even duplicate foreign words he had never seen before—all while blindfolded. 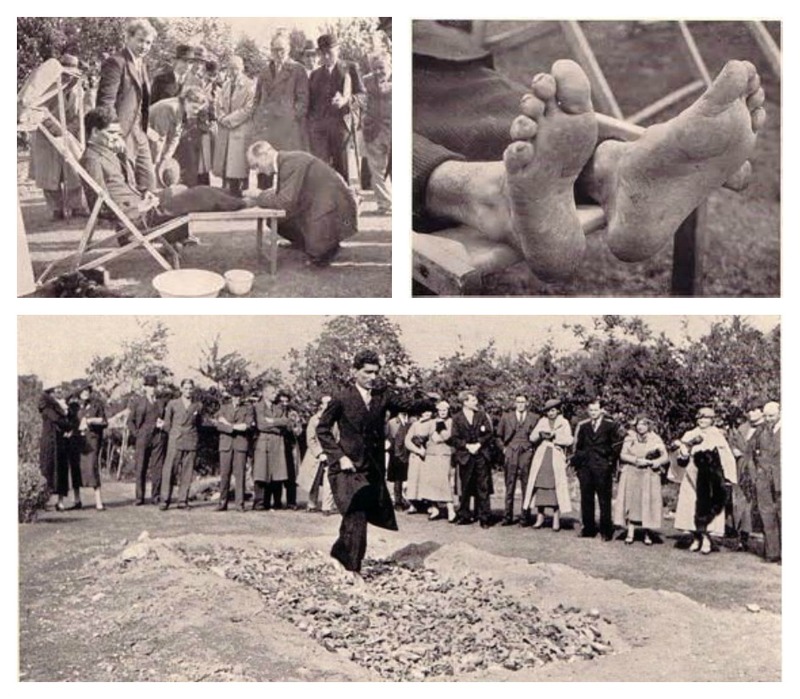 In 1937, Kuda Bux performed the rather extraordinary feat of walking barefoot across a fire pit 12 feet long and 3 feet deep and filled with burning charcoal. He repeated another walk through this fire pit, yet his feet showed no signs of being burnt. This particular fire walking has always fascinated me. Having lived in Durban, South Africa, I was fortunate to witness this Hindu ceremony a number of times. Each year a number of devotees, after fasting for a month beforehand, would walk through a fire pit as part of their religious fervour and they would be unscathed. The fire pit was prepared with burning wood and once this was down to hot, glowing embers (like a barbecue), they would walk through the pit without being harmed. All I could do was vouch for the heat of the fire pit. A little later in Liverpool, Kuda Bux walked along the entire narrow ledge of a long building 200 feet above ground while blindfolded. Then in 1945, he rode a bicycle skillfully through the congested streets of New York and Times Square, again with his eyes tightly taped shut. 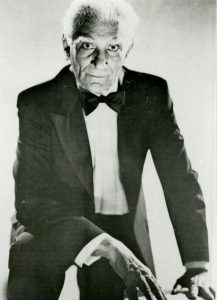 In the 1950’s, he starred in his own CBS television series entitled Kuda Bux – Hindu Mystic where he performed not only his blindfold act but also a series of mentalist and psychic-type effects. He also appeared on the Johnny Carson Show You Asked for It. Kuda Bux was also able to fire a pellet rifle while blindfolded at a target pinpointed by an audience member quite accurately. He became the first magician to appear on Robert Ripley’s first ever televised Believe It or Not. He was often booked for large-scale seminars and magic events or conventions, and both the IBM’s Linking Ring Journal and Genie Magazine featured him on their covers with articles about his strange powers. There are many magicians even today who do not know how he accomplished his remarkable feats—which were even more puzzling because when not blindfolded and reading fine print, Kuda Bux was obliged to use reading glasses. In his latter years—and strangely enough—Kuda Bux became blind after having developed glaucoma. But before this, he spent his evenings at the Hollywood Magic Castle (where he had so often been booked) playing cards with Professor Dai Vernon. He retired in Los Angeles and lived to the age of 75. He passed away on February 5th 1981 from a heart attack. While he may not be well-remembered as a grand illusionist in the history of magic, Kuda Bux will however be well-remembered for his unique performances as the “Man with the X-Ray Eyes” who once stated, according to the late Dutch magician Peter Pit, “I believe in card reading but I don’t believe in card readers. 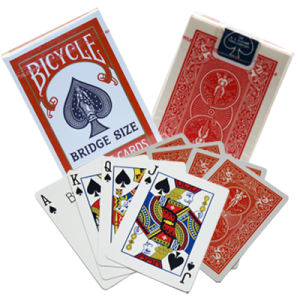 I believe in mentalism but I don’t believe in mentalists. I believe in spiritualism but I don’t believe in spiritualists.” Kuda Bux was certainly a remarkable performer and as yet there is no magician who has ever come close to matching his extraordinary skills.